By popular request, here it is: a Fashion Law ethics & professionalism CLE program! 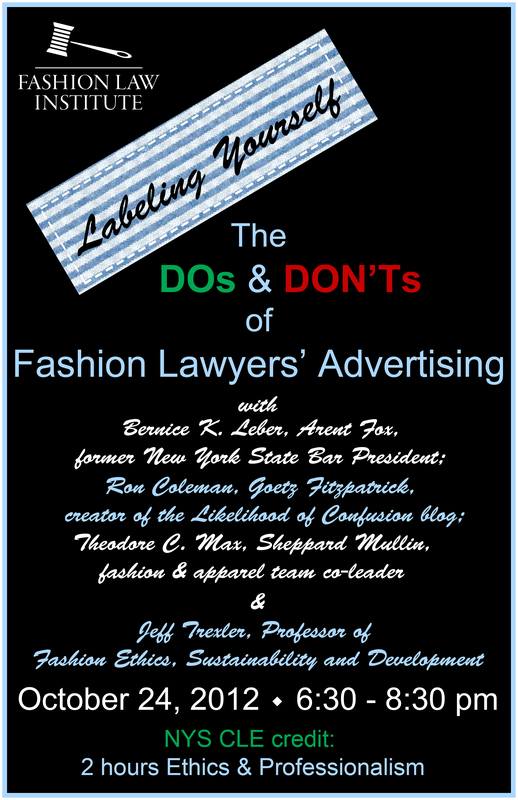 Please join us for “Labeling Yourself: The DOs and DON’Ts of Fashion Lawyers’ Advertising.” Our distinguished panel will discuss strategies for maintaining professional standards while promoting a practice in this newly defined and growing field. CLE credit: 2 hours (ethics & professionalism; transitional and non-transitional). To inquire about our hardship policy, please contact us at info@fashionlawinstitute.com.